What is a Data Security Portfolio (DSP)? Data security is never achieved from a single approach solution. In today’s threat environment, guarding an enterprise’s sensitive data requires a dynamic and diversified data security portfolio (DSP). So what is a Data Security Portfolio comprised of? Effective data discovery means an organization can locate sensitive data, find out how it is being used, and protects it against loss, theft, or leakage. A system should be adaptable to the full range of data storage tools, and be able to discover the same data in cloud services such as Dropbox, Azure, Office 365, Box, Exchange, Google Drive, SharePoint, as well as File Shares and databases. Classification is never as simple as placing markers and tabs on a file. In order for a classification solution to be effective, it must be able to enforce protocols and trigger automated commands for users to properly label files and prevent exfiltration. As the volume of data companies need to manage grows by the day, an increasing challenge in the field of Discovery and DLP is the problem of data misclassification. Over the years, organizations have become besieged with old, deep-rooted data files and emails bringing on irregular, partial compliance with access control policies. Misclassification correction means detecting mislabeled or unmarked files and emails, and applying the appropriate data protection policy. Classification should never really depend on human input alone. To fully ensure proper classification, any platform must be backed up by artificially intelligent algorithms that understand the users policies and automatically detect and identify sensitive data over time. Even after a network has a handle on classifying data and preventing exfiltration, it still faces the challenge of knowing the real nature of the files it allows in. Data inspection is the ability to detect compromising content and malicious programs. An effective Data Protection / DLP platform will use a series of detection algorithms to identify the presence of unsanctioned activity. GTB’s DLP That Works provides the very highest in Data protection assurance, addressing all of the elements of data protection. GTB's artificial intelligent algorithms help to ensure data detection beyond human user activity. Systems conduct deep network scans and behavioral pattern assessments to uncover hidden malicious activity. Moreover, GTB Data Security product portfolio can easily be integrated with the most widely used CASB, Data classification and Information Rights Management programs on the market, augmenting systems such as Titus, Bolden James, Azure Information Protection (AIP), Cipher Cloud, Zscaler, Seclore among others. One of GTB's unique solutions, the Data Misclassifiertm helps to ensures that increased data volumes will not result in files becoming mislabeled or lost. 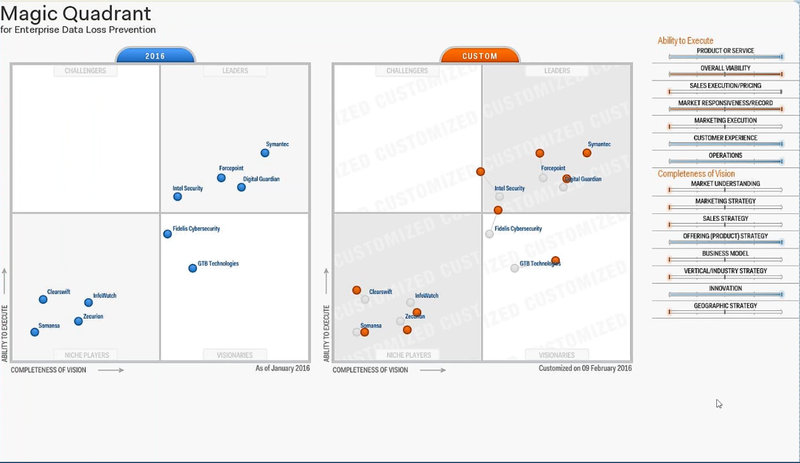 GTB's data security portfolio / data protection platform is consistently highlighted in analyst reports, including Gartner's magic quadrant, Forrester wave, IDC market guide, Radicatti quadrant, etc.